Happy Friday! I think every week should be a short week, and every Monday, a holiday. I kinda like it! 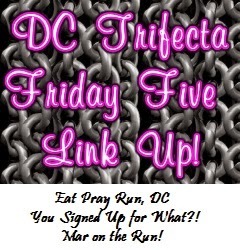 Today I am linking up again, with Cynthia, Courtney and Mar! The topic today is "5 things in my gym bag". But since I run outside or on my treadmill, and do strength training dvd's at home, I don't go to the gym. So I will list the 5 things I always take with me on my long runs. 1. 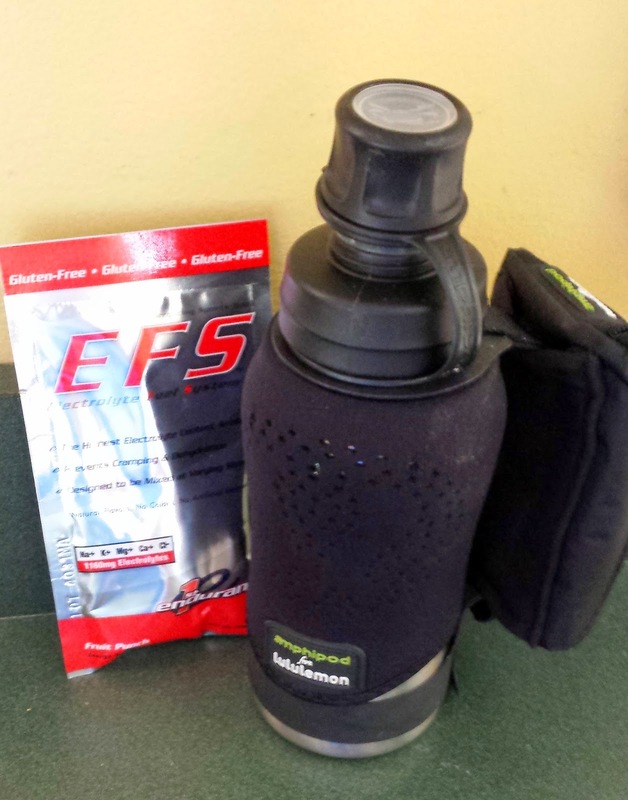 My handheld Lululemon water bottle and a package of EFS. (Electrolyte Fuel System) This stuff is way better than Gatorade, doesn't hurt my stomach and I can feel the energy! I also love that my bottle has a little pouch where I can stash things! 3. Of course I don't bring gel's for my short runs, but always for my long runs. 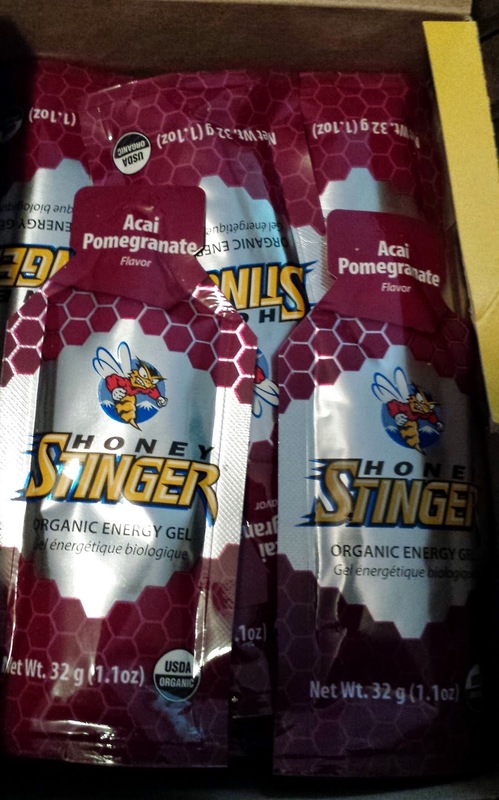 I used to be a GU girl, but have recently switched to Honey Stingers. They go down much easier than GU, and I love the slight honey flavor. 4. 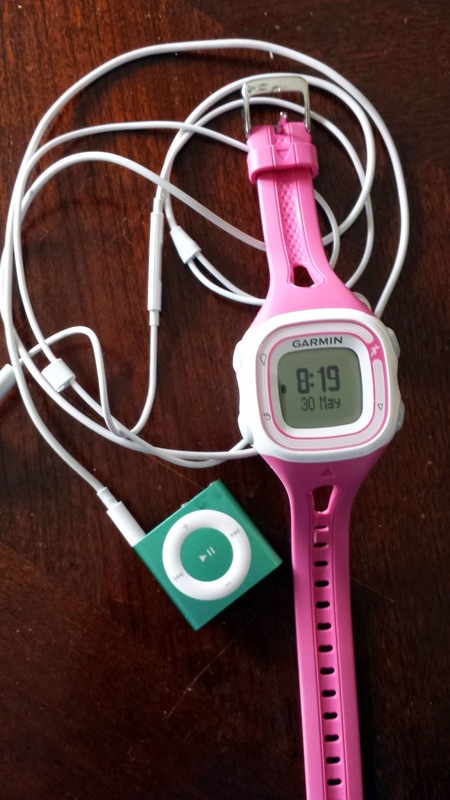 My Garmin FR10 and my Ipod shuffle. I love my simple Garmin, it's not all fancy and complicated. It has exactly what I need; time, pace, distance and calories. And of course my Ipod, I have a hard time running without music! 5. Last, and maybe most important, is my Road ID. This is SO important. If you don't have one, GET ONE. What is something you always take on your long runs? Anyone running or racing this weekend? I don't have a race, but plan on getting a long run in! 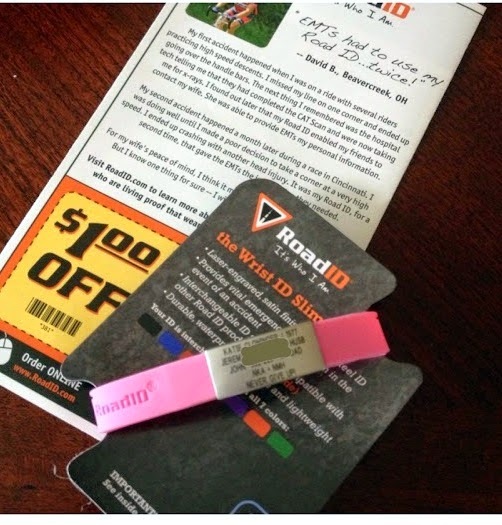 I love my road id and wear it every run and bike ride. I'm not good with the handheld water bottle I usually use belt with water. I'm a honey stinger lover as well. I've been using the chews but am going to try out the gels, hope I like them! My road ID and cell phone are a must!!! I always bring my amphipod belt, gels, hat, shoes, sometimes compression socks. I have that same Garmin! And congrats on the new shoes, so pretty! Those shoes are sooo pretty!! I also have my Road ID! RoadID is a must!! love honest stingers as well but I can't do gels so use the chews! i have the same garmin and i LOVE it! 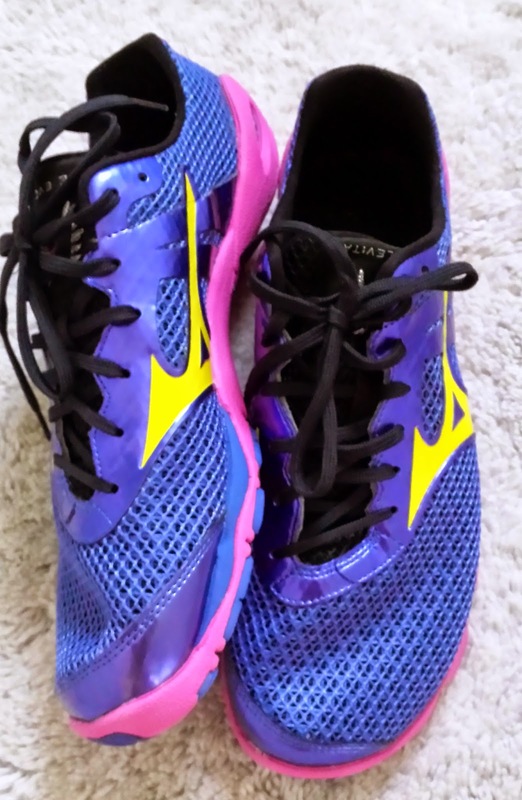 I'm also a Mizuno shoe wearer, and I have the same Garmin in purple! I'm thinking about getting an IPod shuffle too. And yes to the RoadID! I recently wrote about it too. A must have.